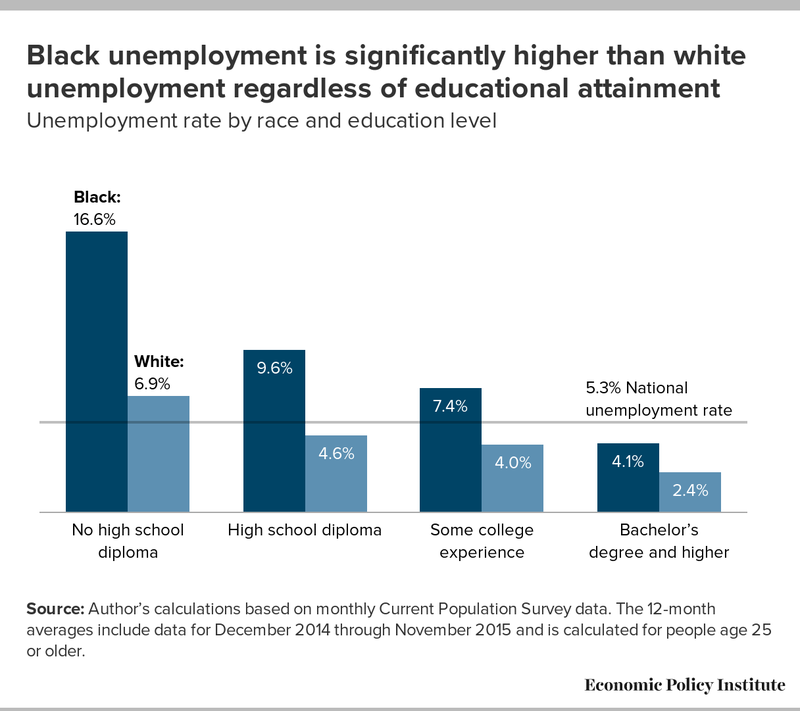 The black unemployment rate is nearly or more than twice the white unemployment rate regardless of educational attainment. It is, and always has been, about twice the white unemployment rate; however, the depth of this racial inequality in the labor market rarely makes the headlines. Source: Author’s calculations based on monthly Current Population Survey data. The 12-month averages include data for December 2014 through November 2015 and is calculated for people age 25 or older. Over the last 12 months, the average unemployment rate for black college graduates has been 4.1 percent—nearly two times the average unemployment rate for white college graduates (2.4 percent) and equivalent to the unemployment rate of whites with an associate’s degree or who have not completed college (4.0 percent). The largest disparity is seen among those with less than a high school diploma: while whites with less than a high school diploma have an unemployment rate of 6.9 percent, the black unemployment rate is 16.6 percent—over two times the white average. The broader significance of this disparity suggests a race penalty whereby blacks at each level of education have unemployment rates that are the same as or higher than less educated whites. It also means that black college graduates are the only group of black workers who have an unemployment rate similar to the overall unemployment rate, as you can see from the horizontal line in the above chart. For whites, the only group whose unemployment rate exceeds the national average is those with less than a high school education. Persistent disparities in unemployment are constant reminders of how race continues to have an undue influence on life in this country.